Once in a while a product comes which I think is pretty awesome. Angel Craft has some self adhesive vinyl in some really awesome colors. I was able to obtain some 6×6 and 12×12 squares through Amazon. These are made specifically for the Cricit machine, but most of my crafting friends say these will work in other machines as well. So I did what any good wife would do when she has the chance. I kicked my manly husband square in the teeth. I created freeloadinghouswife.com in bright pink colors. I’ll be putting this on the rear window of our four wheel drive. It’s a wonderful feeling knowing will be driving around with hot pink letters on the window. I was able to purchase this product through Amazon and you can also. I was able to do so for a discount in exchange for an honest and unbiased review. I have no relationship with the seller and I received no compensation. To see the end result follow me on social media. Being a freeloading housewife isn’t always easy. I’m passionate about the things I can get for free. I’m not a fan of spending a certain amount of money and get free shipping. If I have to pay shipping for something I want, I’ll buy it off of Amazon and use my prime account. Sharing links and getting people to sign up for them is important if you want the best free stuff. I feel sorry for my husband. I make him sign up for stuff, too. My last post was about spinning to win with an app called Qrikit. For every person that signs up for Qrikit using my link, I earn $1. My husband signed up and he can earn his own money by spinning. I can cash out to my paypal account when my balance hits $25.00 and so can my husband. That’s $50 every 6 weeks or so depending on if you remember to spin. It takes less than 10 minutes a day. My friends sign up, but my readers don’t. It’s something I don’t understand. I earn nearly $100 a month in Amazon gift cards from all kinds of places and share them with my readers. For some link sharing, there is something you must do in order for me to gain something. I always explain that when it applies. Surveys are an easy way to earn money during down time like waiting in the doctors office or watching a movie your husband wants to watch and you don’t. It doesn’t take any time at all. I also earn $1 just for you signing up. 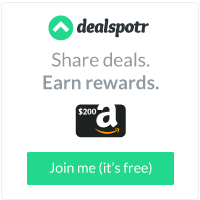 Earn 50 points and you can cash out for a $5 Amazon gift card or save up 100 points for $100 via PayPal or an iTunes gift card. Send me an email at FreeLoadingHousewife@gmail.com (if I open the link for you on my blog it’s considered phishing and I don’t want that) with your referral links for anything and everything. Let me know if you just need me to sign up to earn or if I need to do something, such as make a purchase. Also let me know if you blog and your blog link. I will not share your information with anyone. I wouldn’t even know how. If I like the link and use it, I’ll share the information with my readers and give an honorable mention to your blog. There are companies, apps, products and gift cards just begging for someone to claim them. I research them and let you know which ones work. I’ll warn you about scams and educate you on ways you can earn from home. You won’t get rich but it’s just possible you can become a freeloading housewife, or even house husband, just like me. There are so many things I like to share. I plan on sharing them here because my family is tired of listening to me talk about the same things all the time. I’m official. I feel like doing a happy dance. I have my own domain name. That’s a pretty big deal. Now all that’s left is to write interesting topics people want to read about. I’m not sure how many people are going to want to read about the things I find interesting. My husband continuously asks me if I can think of something else to discuss when I get on a roll or excited about some new discovery. Take this journey with me. Be excited with me. The future is going to hold a few different things for us as a family. We’re looking into an Etsy store so any advice you may have, please feel free to share. I’ll be posting product reviews for some of my most favorite items I’ve received to test. I’ll be posting some affiliate links to sell something, although I have no idea what it’s going to be at this point. If you have any suggestions, please feel free to share those too. I have a YouTube Channel for which I haven’t posted a single video on yet. I’m actually terrified to do something like that. I’m so excited on so many different levels I don’t know where to start. I need to take a deep breath and come up with a game plan. My husband laughed at me when I told him I was too busy working today to help him paint. He just doesn’t understand the fine nuances to freeloading. I have had a rather busy day so I’m going to keep this post short. It won’t happen often so appreciate the novelty while it lasts. While you’re waiting for my next blog post, send me an email. Tell me how you want to save money, or even earn money. I want you to be involved in the process. I will admit I have an ulterior motive. I’ll be using your questions as topics. It is my goal to arm the households of America with all of the best ways to save and earn free money. There are so many companies out there that want you to use their apps, they’re willing to give you Amazon gift cards to use them. There are some companies that offer more gift cards than only Amazon. There are also companies out there that will give you a little something for a whole lot of nothing. One of the best out there to earn cold hard cash is Poshmark. A friend of mine sent me her sign up link during a flash sale they were having. The company gave me $10.00 for using her promotional code. The flash sale was $0.99 shipping. I chose a really nice necklace. At the end of the transaction, I didn’t have to spend any of my own money. There are so many nice things listed. If you need to make some extra money for your household, this is a great place to start by selling those pre-baby clothes. It is legitimate. The cost of shipping is on the buyer. You have to have a PayPal account if you want to sell. Go to Poshmark and sign up for an account. Use my promotional code JMDKY to earn $10.00. If you actually buy something with that free money I’m passing out, I earn some money too. I’m the youngest out of six children and then some. If you add in the “and then some”, which are siblings I wasn’t raised with, that jumps the number to nine. Only one brother. I still feel sorry for him. My mother did her best raising us on a waitress’s pay and tips. For those of you that wait tables, I’m sure you can sympathize with the struggle. Stretching the almighty dollar is something I learned at a very early age. Some of my fondest memories as a child revolve around going to Aunt Sally’s. All of my friends thought my Aunt Sally must be the best aunt in the entire world. Every time I visited, I came home with something new. What none of my friends knew at the time was that I have no Aunt Sally. I didn’t then and I don’t now. I’m totally unaware of where the Aunt Sally moniker came from, only that we used it. Aunt Sally’s was the local Salvation Army. In my younger days (before middle school) the only brand new clothes I remember getting were either clothes my mother made on her sewing machine or something my older brother or sisters spent their hard earned money to purchase for me. Being the youngest had its advantages. I have managed to convince a few readers to use Yerdle in an effort to give away things they don’t need or want anymore. I’ve given away almost 400 items. Some of my friends have even journeyed with me into the world of reviewing items for Amazon sellers. Steve and I have each received new wedding bands. I have over 50 essential oils from assorted brands in various scents. I have an oil diffuser in nearly every room. Steve’s daddy has a set of new paint brushes. We all have new pillows for our beds and even pillows to sit our sore behinds on. I have so many beauty products, my husband thinks I’m searching for the hidden Fountain of Youth in the bottom of jars of creams and scrubs. Even the cat has new toys. I haven’t spent a single dime of my own money because I’ve earned legitimate Amazon gift cards. You can read an earlier blog post entitled It Pays To Snap Receipts to find out how. Checkpoints is another app that I started using that gives away Amazon gift cards. You can earn points every day just by watching previews for movies coming soon to a theatre near you. Log in every morning and select play all. At the end of the video runs, you’ll earn points. At the end of the month, you will have earned enough to be applied to a gift card. There are also other ways to earn points with Checkpoints that are very similar to Shopkick. Download Checkpoints and use my code bvenable to start out. The points are easier to earn than with Shopkick. It works about to about 350 points to every dollar. Shopkick has the better rewards, but it’s harder to earn the points. Raise is another app that I wish I had known about several years ago. Gift cards can be a simple, very little thought out gift to give. For our family, it wasn’t a very appreciated gift to receive. My daughter in college was usually the recipient of a white elephant gift card. Raise is an app that allows you to sell your unwanted gift cards. Visit the App Store and download Raise, use my code (bvenable) and get yourself a $5.00 gift card for $1. The most excellent thing about Raise is there are some gift cards available to purchase at nearly 75% off. Who wouldn’t want the ability to buy a $100 gift card to their favorite restaurant for $25.00? If you choose to get your gift card, I’ll earn a bonus that I can use to get another gift card. You see the cycle here? Then you can convince your friends to sign up and you get a bonus. If you want to keep going, check out Touch of Modern for some really interesting items. The link will give you $10.00. I ordered a toilet bowl night light. I couldn’t resist. It only cost me a couple of dollars, and my friend will earn $20 when my order ships. Don’t stop there. eFurb offers free shipping on all of their items. You get $10.00 to start. They sell refurbished electronics and appliances. I’m desperately trying to convince my husband we need a wine cooler that holds 10 bottles of wine. He doesn’t think anybody needs that many bottles at any one time. Clearly his education is lacking. If you make a purchase, I earn $10.00 when your order ships. There are some inexpensive items on the site. They all come with a 1 year warranty. There have been many times in my life, to the disappointment of our children, they stayed home when they received an invitation to a birthday party because we simply couldn’t afford to buy an extra gift. Use this opportunity not to disappoint your children. I’m constantly trying out new promotions and apps to see which ones are legitimate, which ones require entirely too much effort and which ones are scams. I’ve tried more scams than I care to admit. But I’m only out the time it took to determine something was a total flunk. The ones I share with you are the ones that I have tried and been successful using. I do a ton of giving through Schoola. It can be used as a fundraiser for schools. It’s totally mission oriented. Schoola has kids clothes, too. Forty percent of your purchase funds school programs. There’s a $20 free sign up bonus if you use my link. Awesome, right?! Gilt offers a $25 sign on bonus. I ordered a candle that didn’t cost me anything. This can be accessed through your browser and they have an app as well. I only benefit if you buy more than $50.00, so grab your free stuff. There is a total of more than $60 here for you to claim if you haven’t tried any of these apps. What are you waiting for? You can get started on your Christmas shopping earlier than normal. If you happen to be a snob and won’t purchase anything used, all of these places with the exception of eFurb, offer items new, with tags. Until next time, email me your referral links. If I haven’t tried them, I’ll check them out. Writing is supposed to be therapeutic. I had a doctor of psychology tell me that when I was in my late teens and early 20s. And no, I wasn’t under his care. I met him when I worked for an attorney. I’ve been writing some sort of nonsense or other since then. I write letters to my children that I never send. I write editorials to newspapers that go no further than my desk, which happens to double as the kitchen table. It’s why we eat in the living room on the couch with dinner trays. I’ve submitted newspaper articles, writing contests and even sold a short story once. Don’t ever do that. If you sell something it’s no longer yours. I write my husband love letters. I don’t think I’ve actually given him one in years. If he were romantic, he would tell me every time I speak to him it’s poetry in motion. He’s more inclined to tell me to stop nagging him about the trash. I don’t do trash. I also don’t fuel up my own gas tank either. There are a few other things I don’t do, but I won’t bore you with them. I’m not the best writer in the world, nor do I think I’m the worst. I know I’m not the worst. Have you listened to the lyrics of some of the newer songs lately? I write absolutely nothing about everything. It was the suggestion of my father in law to start a blog. He thinks highly of me and my opinions so thinks everyone should want to hear my pearls of wisdom. He doesn’t use a computer or a device. The old fart doesn’t even own a cell phone. But he knows about Blogs. I wrote a post not long ago on being paid to snap receipts. If you haven’t read it, I suggest you do so. My email has absolutely blown up since then. I have been invited to try Receipt Pal (which isn’t taking new members) Ebates, Mobii (which wants access to my microphone to listen to my television) Bing – apparently they let you earn points for using their search engine that can go toward an Amazon gift card. Who knew? I’m sure there are a lot more out there. I invite you to let me know about them. I haven’t had an opportunity to try them all. After I check them out, I’ll pass the information on to the readers. These money saving tips actually do work. I just turned in my $25.00 iBotta rebates for an Amazon gift card. I was able to get my husband a new wedding ring. His is somewhere in the berry patch. If you’re looking to make a quick buck, bring your metal detector. I’m hoping he’ll be somewhat romantic when he receives it. My newest thing to be excited for is Dollar General. I have friends and family who won’t shop there. Is there such thing as a discount store snob? So here’s the deal: E-Coupons on your smart phone! I’m sure other stores have them. I just don’t know which ones. But I will be doing more research on this matter. Saving money is a very serious business. Sign up at http://www.dollargeneral.com and link up your cell phone. Then load your coupons. When you check out, before you swipe your debit card, sign in with your cell phone number and watch your total decrease. I can also couple this with my other receipt snapping apps. So start doing a little bit of research. Find out what’s available. My journey started with Walmart Savings Catcher. I figured if Walmart was doing it, someone else must have done it first. My goal this year is to be able to put some of the money I save throughout the year into a savings account so my husband can retire early. I also believe in hedging my bets, so I play the lottery from time to time. Farewell, good friend, until next time I leave you with this thought: If it’s drink, drank and drunk – why can’t it be think, thank and thunk?